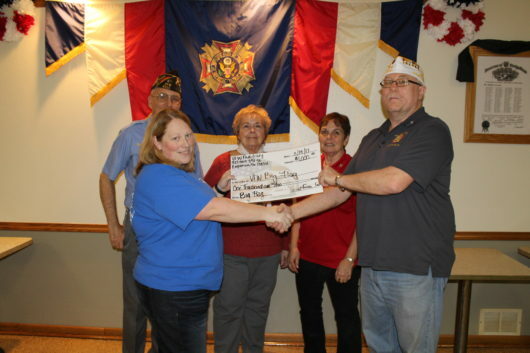 The Ca meron County VFW Post 6221 Auxiliary donated $1,000 to the Veterans Memorial Park fund to help cover the costs of ongoing maintenance and improvements. Funds were raised through the annual Cash Bash fundraiser. Shown (l to r) are Barry Sarick, VFW Quartermaster; Jenn Dixon, Auxiliary President; Georgiann Holly, Auxiliary Junior Vice President; Bev Jones, Auxiliary Senior Vice President; and Dennis McCulla, VFW Commander.